Today is a bad day for planet Earth. We've just reached Earth Overshoot Day, the date by which humanity has used up its yearly "allowance" of Earth’s natural resources – and it's earlier than it has ever been before. Global Footprint Network (GFN) is the think tank behind Earth Overshoot Day. Each year, they work out the day in the year where humanity’s demand on nature exceeds what Earth can regenerate in that year. It’s all worked out with 15,000 data points per country from datasets from the United Nations and recent scientific literature. Using this information, they then simply divide the ecological resources Earth is able to generate that year by humanity’s annual demand. The figures suggest that humans will consume 160 percent of Earth’s total annual capacity by the end of the year. 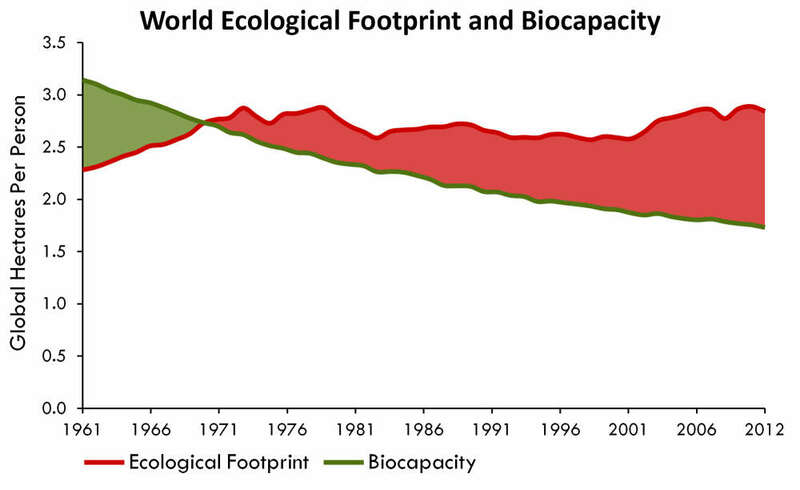 The balance between our biocapacity and our ecological appetite had a turning point around the late 1960s. Global Footprint Network. With humanity’s appetite for natural resources continuing to grow, this day is creeping up sooner and sooner each year. Last year, we used our fill by August 9, five years ago it was August 11, 10 years ago it was August 24, and 40 years ago it was November 19. However, it’s not all doom and gloom. The rate at which Earth Overshoot Day has edged backwards has slowed over the past five years. During the early 1970s, the day was falling backward an average of three days each year, but it has now slowed to less than one day a year. You can join the conversation on Facebook, Twitter, and Instagram using #overshoot or #pledgefortheplanet.